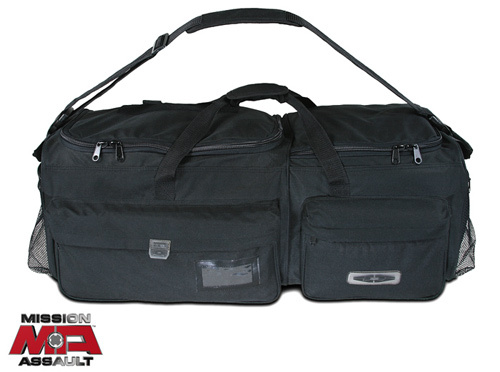 Mission Assault� Duty / Gear Bag The #DB-1 is designed to carry Damascus Crowd Control and/or SWAT gear and includes a separate helmet storage area. Quality construction consists of 700 denier, water resistant Cordura nylon, heavy-duty zippers and removable nylon web shoulder strap. Nylon web carry handles are on both the sides and ends of the #DB-1. Features include a removable rigid bottom in the main compartment and padded exterior walls in the helmet compartment. Three zippered cargo pockets and two zippered mesh pockets on the exterior hold a wide variety of items. Velcro� straps on the padded top can secure a baton or flashlight. Dimensions � Total dimensions: 34"L x 10"W x 12"H � Large interior compartment: 20"L x 12"W x 12"H � Small interior compartment: 14"L x 12"W x 12"H � Available in black only.